Putting a firm FOCUS on agriculture as a key pillar of the state’s economy is essential if we are to lift agricultural production toward the national target of $100 billion by 2030. When agriculture does well, rural and regional New South Wales does well – continued investment in our regions sustains agricultural communities and keeps communities strong. 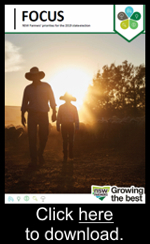 NSW Farmers has identified our top 15 priorities for the agricultural sector over the next four years. When delivered, they will help to super-charge agriculture, sustain regional and rural communities and grow the value of our food and fibre production. The outlook for agriculture is indeed a bright one. Despite recent challenges with drought and the climate, our farmers are continuing to grow the value of production and chase new and emerging markets. Adopting new technology and driving innovation will see this commitment to a profitable and sustainable farming sector grow now and into the future. Should the drought deepen, farmers across New South Wales will continue to face challenges, particularly cash flow pressures. It will be critical that government recognises these ongoing pressures and the challenges farmers will face in restocking and replanting following viable rain. Rain will begin the recovery, but revival of rural and regional communities, and the agricultural sector, will take years. Food and fibre producers from across New South Wales want their politicians to put their concerns front and centre – it’s time to FOCUS on agriculture and deliver for rural and regional New South Wales.